The field proven WorldPower™ UPS line is ideally suited for military, industrial, computer and telecommunications applications requiring high reliability, rugged construction, compact size and light weight design. These units are equally suited for use in shipboard, airborne, vehicular, field deployed or fixed locations with controlled or uncontrolled environments. The ETI0001-2229 is The ETI0001-2229 is specifically designed for lightweight global power by the US Navy as the power source for critical systems because of the stringent performance and reliability requirements. 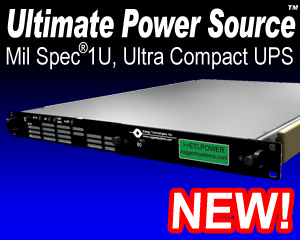 The heavy-duty chassis, occupying only 5.25”(3U) of rack space while delivering up to 2000 VA of clean, uninterruptible power. The rounded metal corners and rugged handles front and rear, aid in safe handling. Internally, all major components are well secured and electrically insulated to prevent damage due to shock and vibration. These units can be mounted horizontally or vertically. Optional heavy-duty rack slides provide easy installation and removal of the unit with full extension. All controls and protective devices are brought to the front and rear panels with critical switches or circuit breakers having finger guards. Further, all front panel devices are recessed to prevent damage or accidental operation. Clips on the front panel hold spare fuses for ready access. The input circuit breaker and the galvanic isolation transformer all provide a double pole isolated source for shipboard systems or overseas locations where phase references and grounding are not consistent. The manual bypass feature included is operated from the front panel. Even in the bypass mode, the ETI0001-2229 still provides galvanic isolation, transient surge protection and EMI/RFI filtering. The ETI0001-2229 has the added benefit of having a field replaceable battery via front drawout battery module. The battery is a true hot-swappable module and does not require going to bypass like competing units. Even with this battery module removed, this UPS can continue to operate as an electronic power conditioner and frequency converter, providing clean, well regulated, sinusoidal power to the load. The batteries are maintenance free with immobilized electrolyte and are constructed of flame retardant materials for added safety. For more information, see the Battery Technology section.